Update 2007.06.08: I selected the photo above as the BBGV group photo for June 2007. Thanks to everyone who weighed in and contributed suggestions. Be sure to check out the comments to this post and follow the links for an interesting blog conversation about why there are so few people in these photos. I'm a co-admin for a Flickr group, the Brooklyn Botanic Garden Visitors photo pool. In May I thought I would start rotating the group photo which represents the group in Flickr. I'm trying to pick the photo for June. It's a tough decision. Over 200 photos were posted in May, out of over 1,100 photos since Paul-M started the group last year. And May is such an explosion. There was the Cherry Blossom Festival, of course, but there are also tulips, azaleas, wisteria, and even roses that have started blooming. So, help me pick. Here are a few of my favorites of the 200, in order by the date taken. Leave a comment and let me know your favorites. Or you can nominate another one from the pool. The only criteria are that the picture was taken during May 2007, and that it's not one of my photos. I'll make a decision over the weekend. Update 2007.06.01: RESOLVED. I've disabled moderation and restored word verification (CAPTCHA) for comments. Due to email problems I'm having, I've temporarily enabled comment moderation so I can review comments before they appear on this blog. Normally I get an email when a comment is posted. This notifies me when a comment is posted. It also allows me to review the comments and delete the few spam comments that get posted within hours of their appearance. Because I now need to explicitly review each comment before it appears, there will be a delay before your comment appears on this blog. In exchange, I've also temporarily turned off the word verification (CAPTCHA) feature which prevents spambots from posting comments. Hope to get things back to normal soon! A Brooklyn Brownstone Garden in Washington D.C. Imagine visiting 12 botanic gardens in just an hour! This summer, instead of spending days, if not weeks, trekking off to the Midwest, Florida, California, the Pacific Northwest, and Hawaii, you’ll be able to experience beautiful gardens from all these regions with just one visit to the USBG. Our summer Terrace display celebrates the beauty and diversity of America’s public gardens -- tropical gardens, conservatories, desert gardens, children’s gardens, and more -- by showcasing twelve gardens from across the nation. Garden Design Online reports that our own Brookyln Botanic Garden's contribution to this exhibit recreates a "typical Brooklyn brownstone, with typical Brooklyn brownstone plantings:"
This exhibit by the Brooklyn Botanic Garden is planted with trees and shrubs that can be seen at the garden and in neighborhoods around the borough -- Magnolia grandiflora 'Elizabeth,' Malus 'Red Jade,' River Birches, Switch Grass, and many more. BBG's Vice-President of Horticulture, Patrick Cullina, said Brooklyn developed many kinds of special gardens that are often found in public gardens across the country. Trulia Hindsight is an animated map of homes in the United States from Trulia. The animations use the year the properties were built to show the growth of streets, neighborhoods and cities over time. 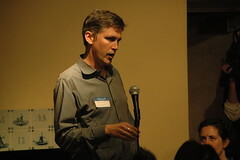 Trulia uses publicly available data for the year of development. For NYC, these data are notoriously unreliable for specific properties; for example, it shows our house was built in the 1930s, although we know it was built in the early 1900s, most likely 1900. Nevertheless, the data are reasonably valid for showing trends. I'll try to get a good screenshot. The Urban Horticulture Institute currently consists of two faculty, one technician and 10 graduate students. The selection, evaluation and propagation of superior plants with improved tolerance of biotic [eg: insects, pathogens] and abiotic [eg: heat, air pollution] stresses, and enhanced functional uses in the disturbed landscape. Bare root trees are one-third to one-half less expensive than B&B trees. Because they are so much lighter and many more can fit on the bed of a truck, they are cheaper to ship. Planting a bare root tree costs virtually nothing when done by volunteers with shovels. The cost of planting a B&B tree, by contrast, is markedly higher because the sheer weight of the ball requires machinery and machinery operators to load the tree, unload it, and to get it in the ground. Over the course of 97 posts and 1602 comments, traffic has grown to over 3,000 unique visitors a day, over 2200 readers have subscribed to the RSS feed, and several articles have been featured on the popular pages of Digg, Del.icio.us, Reddit, StumbleUpon, and Netscape. It isn’t the most amazing start (there have certainly been bumps along the way) but I’m proud of what I’ve built and optimistic the site will continue to grow. I want to share what I’ve learned, but it’d be pointless to try explaining it all. Rather, I’ve compiled a list of the 27 most important lessons. I find I agree with most of the 27. I believe I'm even following most of the ones I agree with. A handful I disagree with; maybe I haven't learned that lesson yet, or maybe my context differs sufficiently from P the B that it doesn't apply. Here's my synopsis, with my reflections in [brackets], including some questions for you, my readers. Read the full post for more explanation of each Lesson. If you have a thought about any of this, please leave a comment. a) help people solve a problem, and b) differentiate yourself. Blogging is not a great way to make money. Make it as easy as possible for people to subscribe to your feed. A bad post is worse than no post. Be prepared to completely run out of ideas after the first 3-4 months. It’s not always what you know, who you know is important too. Write catchy headlines and list posts that will be popular with the social sites. Do everything you can to make your headline and opening paragraph as compelling as possible. Courteously encourage friends, family, and casual acquaintances to vote up and link to your posts. Don’t write every post for the social sites. Listen carefully to every piece of feedback but don’t be a slave to it. If your writing doesn’t have an edge it might as well not exist. Always look for a different angle. If linking doesn’t provide value to your readers it’s a bad idea. Write about your life in a way that’s relevant to your topic. Don’t be anxious to plaster Google Ads all over the place. Posting comments on other blogs is overrated. Respond to your commenters, especially the ones who disagree. Once you have a bit of success don’t flaunt it but let other people know. Make use of blog carnivals. Display your best posts on every page in a prominent location. Do what works for you. Be completely genuine. 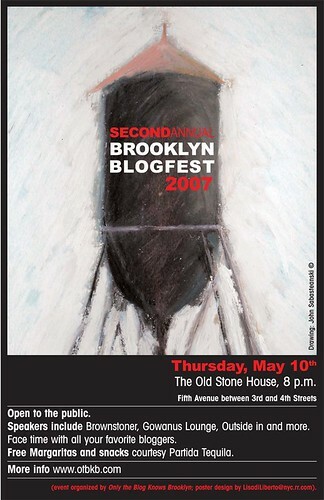 Update, 2007.06.14: Adrian Kinloch, Brit in Brooklyn, came up with these terrific flyers and banners to promote this event. Following the successful Brooklyn Blogfest in May, the Brooklyn Blogade is taking it on the road to different Brooklyn neighborhoods. The inaugural event is Sunday, June 24, 2-5pm. Join us at Vox Pop, 1022 Cortelyou Road, at the corner of Stratford Road (East 11th Street). If you want to attend please send an email to blogade.rsvp@gmail.com. We'll email you an invitation. We will not use your email address for any purpose except for sending invitations and notifications relevant to Brooklyn Blogade. It will not be shared with anyone else for any reason. You can also checkout their full food menu and micro-brew on tap. DIRECTIONS BY SUBWAY: Take the Q Train to Cortelyou Road. Vox Pop is five blocks West (turn left as you exit the station). 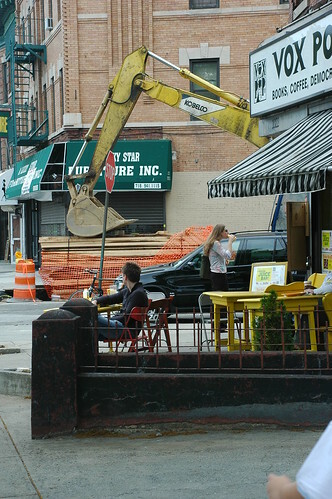 By the way, the above photo was taken during the height of the streetscape work on Cortelyou Road. The back-hoe is gone now. I'll upload a more flattering view. Update 2011-06-13: Corrected address for Root Stock & Quade. 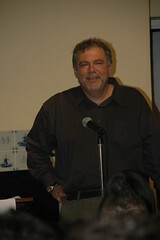 Update 2010.01.03: Corrected all links to the old Gowanus Lounge domain to the new memorial domain. Update 2008.04.29: Added J&L Landscaping, Kensington. Update 2008.04.18: Added Kings County Nurseries. Added link for Zuzu's Petals. Update 2007.05.25: Added Shannon Florist. Red Hook is turning into Brooklyn's Gardening District. ... No less than three garden shops are now open in the Hook. The Chelsea Garden Center Brooklyn has been operating for a couple of weeks at 444 Van Brunt Street, a block from the Red Hook Fairway. The Gowanus Nursery, which lost its space on Third Street, reopened last month at 45 Summit Street. And, this weekend saw the Grand Opening of the Liberty Sunset Garden Center on Pier 41 at 204 Van Dyke Street. A new group of large nurseries that have suddenly sprung up in Red Hook, Brooklyn — since March, three have opened within blocks of each other — is a welcome surprise for many of the city’s gardeners. It got even better when I moved from the East Village to Park Slope. I've lived in Brooklyn for 15 years now, and I'm still learning about new local sources of plants. I've bought plants at all of the following locations except for J&L Landscaping and Kings County Nurseries Chelsea Garden Center and Liberty Sunset. Each has something slightly different to offer for variety, expertise, and access to transportation. Prices vary widely. The Brooklyn Terminal Market generally has the best prices, but requires a car to get to it. Crazy Diamond, aka Flatbush Gardener, circa 1980s. I wrote the following as part of my Brooklyn Blogfest coverage. I now find myself in the position of being one of the coordinators of the first Brooklyn Blogade Roadshow, which it is hoped will take the spirit and energy of the Brooklyn Blogfest on the road to different neighborhoods in Brooklyn. I hope to provide details of the inaugural event later tonight or this week. I'm highlighting this bit of autobiography and technology history in its own post here because it expresses what I'm trying to bring of myself to this first event. Gather round me, children. Close your eyes, and try to imagine it. It was long before the Web, when the Internet existed only in military and select academic settings. It was the time before GUIs, before mice and color monitors, when MS-DOS and 1200bps dial-up modems roamed the Earth. There were these things called computer bulletin board services, BBS for short. Your computer told your modem the phone number of the BBS. Your modem dialed, their modem answered, and both modems connected with each other. Then your computer could talk to their computer. Directly. No Web, no Internet. Machino a machino. You could leave messages for other BBS members; the precursor of email. You could even chat with someone else who was also logged in; the precursor of IM today. I was a member of a BBS based in New York City called The BackRoom. It was, as one might guess from the name, a gay BBS. It was an online community of gay men, mostly, living in NYC, mostly. We had handles, like CB radio users (1970s technology). My CB handle in the 1970s, 30+ years ago, was Green Thumb. My BackRoom handle was Crazy Diamond, after the Pink Floyd song, "Shine On, You Crazy Diamond." 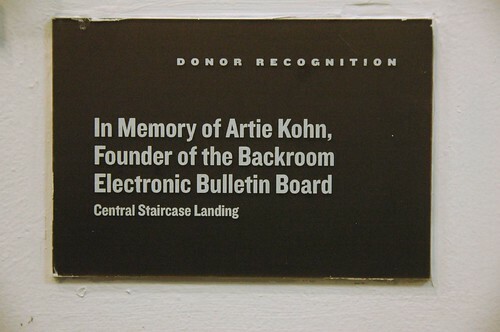 Donor Recognition plaque on the wall of the second floor landing of the center staircase of the NYC Lesbian, Gay, Bisexual and Transgender Community Center. We were an online community. A community of humpy nerds, of which I was one. We were not only virtual. We also met, face-to-face, at a periodic event called the Backroom Bash. Sometimes we met at a bar, sometimes at the home of a member or the Backroom founder and sysop, Art Kohn. We built community online, with handles and anonymity. We met in person, still with our handles, and less anonymity, and built community there as well. Our virtual community was enriched by our interactions in 3D, and vice versa. Last night [the Blogfest] reminded me of that. Reproduction of a painting by Alexander Roslin in 1775. The original painting can be viewed at the Royal Science Academy of Sweden (Kungliga vetenskapsakademin). Carolus Linnaeus, also known after his ennoblement as Carl von Linné, (May 23, 1707 – January 10, 1778), was a Swedish botanist, physician and zoologist who laid the foundations for the modern scheme of nomenclature. He is known as the "father of modern taxonomy." He is also considered one of the fathers of modern ecology (see History of ecology). Taxonomists, in almost any biological field, have heard of Carolus Linnaeus. His prime contribution was to establish conventions for the naming of living organisms that became universally accepted in the scientific world--the work of Linnaeus represents the starting point of binomial nomenclature. In addition Linnaeus developed, during the great 18th century expansion of natural history knowledge, what became known as the Linnaean taxonomy; the system of scientific classification now widely used in the biological sciences. ... While the underlying details concerning what are considered to be scientifically valid 'observable characteristics' has changed with expanding knowledge (for example, DNA sequencing, unavailable in Linnaeus' time, has proven to be a tool of considerable utility for classifying living organisms and establishing their relationships to each other), the fundamental principle remains sound. Of course, any tool can be used against others. Linnaeus was also a pioneer in defining the concept of race as applied to humans. Within Homo sapiens he proposed four taxa of a lower (unnamed) rank. These categories were Americanus, Asiaticus, Africanus and Europeanus. They were based on place of origin at first, and later on skin colour. Each race had certain characteristics that he considered endemic to individuals belonging to it. Native Americans were reddish, stubborn and easily angered. Africans were black, relaxed and negligent. Asians were sallow, avaricious and easily distracted. Europeans were white, gentle and inventive. Linnaeus's races were clearly skewed in favour of Europeans. Over time, this classification led to a racial hierarchy, in which Europeans were at the top. Members of many European countries used the classification scheme to validate their conquering or subjugation of members of the "lower" races. 2) likely to cause economic or environmental harm or harm to human health. 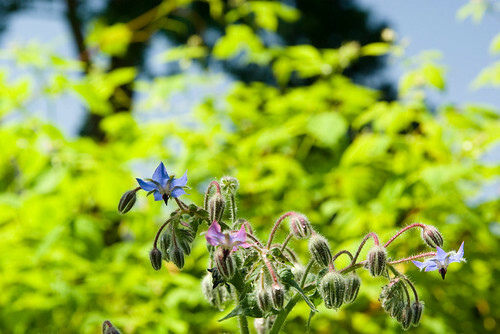 Many, perhaps most (but not all) invasive plants were first introduced by gardeners as ornamental plants. For example, Ailanthus altissima, the Tree of Heaven, was cultivated as a shade tree. 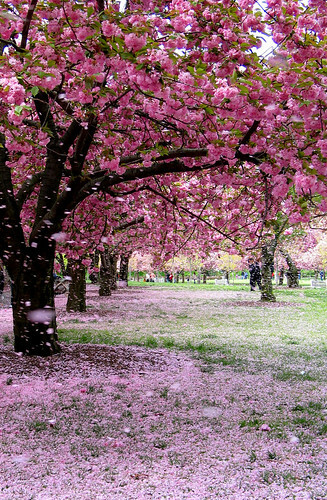 This is the "tree that grew in Brooklyn," and the Brooklyn Botanic Garden even uses its image in its merchandise such as t-shirts and tote bags. Not every plant which can become invasive is a risk in all areas. It helps to understand the ecological region and regime in which you garden and the threats to nearby natural areas. For example, the map of the Plant Provinces of North America in the BBG book Native Alternatives to Invasive Plants places New York City and Long Island in the province of Eastern Deciduous Forests rather than Coastal Plain Forests. Yet Long Island was built from millenia of glacial deposits; the area south of the southern terminal moraine - including most of Brooklyn - has more in common with coastal outwash plains than upland forests. Similarly, Brooklyn's proximity to the ocean and the Gulf Stream moderates our temperatures compared to, say, the Bronx, the only borough on the mainland; our climate is a blend of Mid-Atlantic and New England as gardening goes. Some states have taken the lead in making it illegal to sell, purchase, propagate or plant those species known to be invasive. Some gardeners, and nurseries, label such strategies "eco-fascism" and worse. I would support such legislation in New York, which has not yet joined the ranks of these states. However, legislation should not be the sole strategy. Education must be a primary strategy. 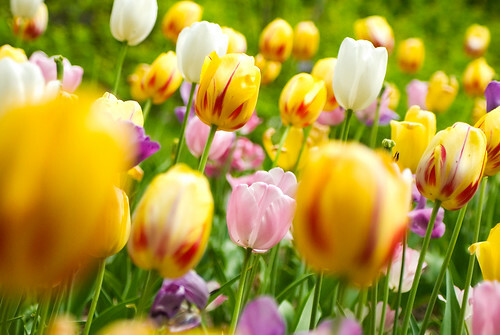 As gardeners, we can learn about the natural areas around us and the threats to them. 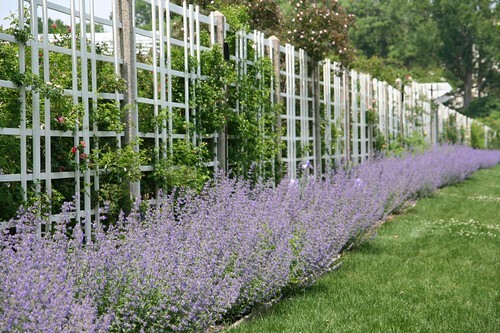 We can avoid purchasing, propagating, planting or recommending plants known to be invasive. We can learn about alternative non-invasive or native choices for plants in our gardens. And we can educate others about these issues and possible solutions. UPDATE 2007.05.23: BCAT has the clips available on their Web site! It's Reporter Roundtable Episode #183. The format is WMV (Windows Media Player) and runs 27:54. The video montage from the Blogfest begins at 08:50. I make my appearance at 10:44, in the first interview. I'm watching the Reporter RoundTable interview with Lumi Michelle Rolley/No Land Grab, Jonathan Butler/Brownstoner and Louise Crawford/OTBKB/Smartmom. They ran a brief segment of footage from the BlogFest. There I was! Larger than life, if that's possible. The video's not available online yet. I'll update this and the Blogfest Coverage post when it is. I sure sound funny. And I have a face for radio. Oh, and I watched through to the end. 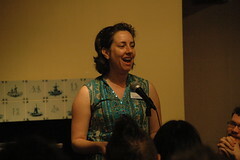 Louise Crawford mentioned that the first "Brooklyn Blogade Roadshow" will be June 24 at Vox Pop. She also announced it earlier this week. I'm helping to coordinate that event, so watch this blog for details and RSVP info as we move further along. A carnival for the birds, I and the Bird #49 is up on Dave Bonta's Via Negativa. I submitted my recent bird sightings and Dave linked to my post about the Cedar Waxwings. Each line in the “found poem” below is a link to the post I lifted it from. I’ve altered nothing but the punctuation, and I’ve included an audio version for those who may have trouble hearing the poetry at first. Who knows how they knew they were there. Out of its original context, it reads more like a Zen koan than a sentence from a blog post. I don't want to spoil the accidental poetry of that line by explaining it. Go check out IATB#49 for all the poetry. I recommend taking the time to listen to Dave's audio recording. 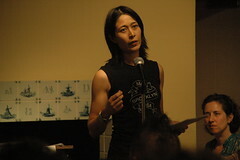 He has a poet's voice. On May 18th, America celebrates [sic] Endangered Species Day! The U.S. Senate has unanimously passed a resolution supporting Endangered Species Day, a national celebration of America’s commitment to protecting and recovering our nation’s endangered species. Americans young and old will learn about endangered species, including the American bald eagle, peregrine falcon, gray wolf, grizzly bear, humpback whale and many of our nation’s wildlife, fish and plants on the brink of extinction. For the next week, millions of Americas [sic] will celebrate Endangered Species Day at parks, wildlife refuges, zoos, aquariums, botanical gardens, environmental agencies, conservation organizations, schools, museums, libraries, businesses, and community groups across the country. For a list of Endangered Species Day events and activities, visit the Endangered Species Day webpage. Guest Post: The Man From B.R.O.O.K.L.Y.N. I received the following from my Dad this afternoon. I asked him for permission to share it here. APOLOGIA: YOU WILL FIND “I” AND “ME” IN HERE OFTEN. That’s because my wife, who is also from Brooklyn does not agree with my outlook. These are MY opinions and do not mean I am insulting my wife or son or other Brooklynites and THEIR opinions. I AM FROM BROOKLYN AND PROUD AS PUNCH ! I AM FROM BROOKLYN AND PLEASED AS PUNCH ! I AM FROM BROOKLYN AND HAPPY ABOUT THAT ! I’m gone, by-bye, far away, moved. It took 65 years but no more $500 annual parking ticket budget, sky rats, strange people sleeping in the streets, passersby arguing with themselves and losing. No more rush hour, subway, shoulder to shoulder bustle and bump, “cleaning” windshields, strange green gobs of mucous on the sidewalk. I was a Great Depression baby, born at home near the intersection of Myrtle and Decatur in Ridgewood. We moved to Queens early in my life but, same thing. Brooklyn was The City, just like Manhattan. If you were a baseball fan, you had died and gone to Heaven early. A ten cent subway ride took you to the Wonderlands of Yankee Stadium, Ebbets Field and the Polo Grounds. I was not a fan. No sense belaboring it: it was a nasty Era and life stunk. My Mom made me wear knickers and a beret ! Our electric was more off than on. Fridays were always cod fish cakes and spaghetti (Franco-American) night. During WWII we also had Meatless Tuesdays. Not that we could afford meat anyway but it makes a good bitching point. When I was married we managed to move out on “The Island”, first to Nassau county and then Suffolk. I had gone through. I was still too much a Dad to realize or even conceive that my kids could think for themselves and make decisions. Wrong again, and not for the first or last time. My son moved first to Manhattan and eventually to Brooklyn where he has a 100 year old Victorian home. The daughter is very happy with her family in New Jersey. The son writes a well received and popular “Blog” about life in Brooklyn, especially gardening. They’re happy, I’m happy. I miss them but not Brooklyn. Here is a partial list of things I do miss: American Museum of Natural History; Coney Island Aquarium; MOMA; the Bronx Zoo; hot chestnut vendors; Horn and Hardart’s Automat; Charlotte Russe; Loew’s Valencia Theatre; Tony the Ice Man; Macy’s Christmas windows; Rockefeller Center at Christmas; more. BUT, I could always visit. Oh my: swimming at the St. George hotel with its’ salt water pool and the mirrored ceiling; the Thanksgiving and St. Patrick’s Day parades; Times Square on New Year’s Eve (just once);……..
Had to stop, starting to choke up. Take a deep breath. OK. I now live in the Blue Ridge Mountains of North Carolina, selected as my retirement spot after years of study. Been here 15 years. I do very well, thank you. We eat out several times a week. I love it. We have a backyard about 100 feet deep and two football fields long. A stream runs through it at the rear boundary. We live at the foot of a mountain. Just a couple of healthy stones throws away is a herd of elk and a pack of red wolves. The gray wolves have not yet been re-released to the wild. The cougars/panthers/mountain lions are gone but you can still find feral pigs, some mixed with European Boars. They hunt them on foot, with spears! What about bears? They are all around us but have never been seen on our property. Sightings have been made within a half mile. Usually a daily incident in the local papers. We gotcher streams, creeks, rivers, ponds, lakes and hundreds of waterfalls. Local fishing waters hold all species of trout; bass species include largemouth, smallmouth, spotted, peacock, striped, hybrid. The North Carolina state record for Bluegill sunfish (2 ¾ pounds) was caught in our home county. Culturally, we miss major league sports. However we have seen Itzaak Perlman, the Lippizaner Stallions, David Copperfield, many operas. We have musical and stage shows, lots of Celtic music and dancing and, as you might expect, tons of Blue Grass. The circus, pow-wows, gem mines. We’re not lacking. Tennessee, Georgia and South Carolina are within a half hour’s drive. City lovers would miss the 24 hour lifestyle. We tend to roll up the sidewalks around 9:30 PM. So, all-in-all, it was a great move. We still visit the son in Flatbush and the daughter in Brick, NJ. We absolutely avoid Long Island at all costs. There are a few other ties to The City. I still have a plot in Calvary Cemetary. It will go unused. So, my dear son: revel in your Brooklyn home with your partner. You have chosen, and wisely for you. My plan to protect you was a flop and thank goodness for that. I am still happy to be FROM Brooklyn. But I have a friend there whom I can visit whenever possible. He opens my eyes to the things I overlooked and broadens my knowledge base and horizons, even at the age of 75. I am blessed in all things. I just got off the phone with our roofer. On Monday they start replacing our roof. I took this photo in January of 2006. 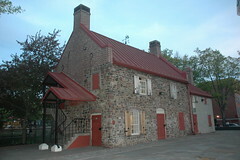 It features the front of our house, which faces West. You can see the front garden area and most of the front gable. The South side of the house has one of the side gabled dormers and a wide, sunny border between the house and the driveway. In our case, because of the multiple layers of shingles accumulated over the years, "replacing the roof" means tearing off the entire roof, including the original cedar shingles, circa 1900, down to the rafters and furring strips. 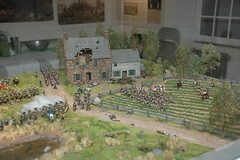 It also means a big mess on all sides of the house, especially the north and south sides sloping down from the gables. 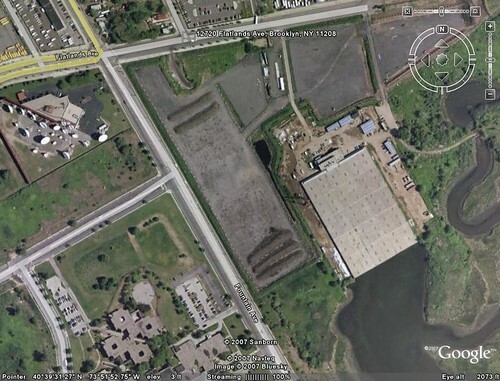 Here's an aerial view from the rear/East side of the house, courtesy of Microsoft Live Maps. This gives you a much better idea of the layout and size of the roof. 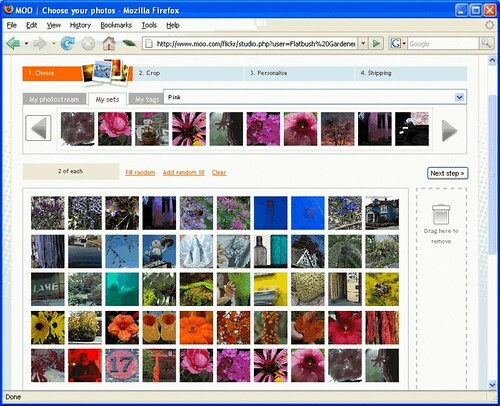 The Flickr photo page has notes explaining the features visible in this photo. We expect this project to last about a month, give or take. The roofer has promised to build sheds over the gardens to protect them. I hope so, yet I'm not counting on it to save everything and I can live with some damage. We knew when we had the house inspected 2-1/2 years ago before going into contract that we would have to do this. I've been holding off for two years on any big gardening plans which would be affected by this job. The backyard won't be affected much. I'll setup a plant refugee camp there for anything which needs to move, including all the containers at the front of the house. I've already transplanted some plants from the ground into containers or to beds which are at lower risk of damage. They should be fine for a month. We'll see what happens! Watch for periodic updates. 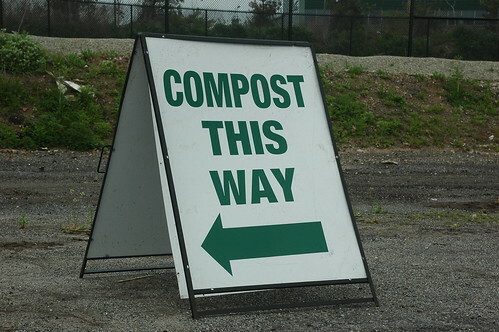 The Brooklyn-Queens Compost Giveback continues this Saturday and Sunday, May 19&20 at the Spring Creek Composting site [Google Map]. Blog Widow John and I went last Saturday. I was not allowed to take pictures at the event. Rumor on the ground was that the property is being examined for development. I took the one photo above before I was told photography was not allowed. Fortunately, there's Google and satellites. Check out the piles of compost! I armed us with two broad-faced shovels, a pitchfork, a plastic bushel-sized bin, and heavy-duty plastic contractor's bags. We backed up to a rapidly dwindling yet still impressive long row of compost and had at it. 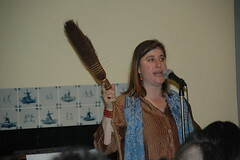 The Queens Botanical Garden was on hand to provide advice and literature. 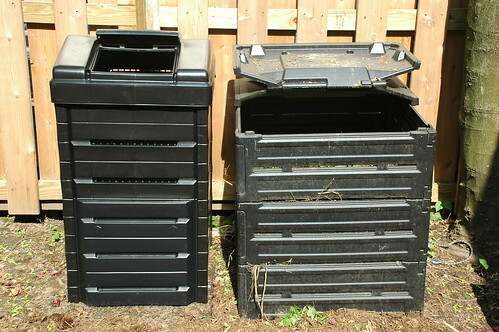 I also picked up two Garden Gourmet composters at $20 a pop. I put one of them together on Sunday. I've used Smith & Hawken BioStacks for many years. I'll come back with a comparative review of the two designs later. Event, Sunday, May 20: PLG = Plants, Leaves, Green! Across the Park (ATP) announced today that residents and friends of Prospect Lefferts Gardens can get their green on next Sunday, May 20. The spruce up for Lincoln Road between Ocean and Flatbush Avenues is organized by Prospect Lefferts United for Services (PLUS). See their posting for details. I was amused to see that the poster announces that the after party will be held at Meytex Lounge, whose facade was recently described as scary in New York Press. ATP goes on to note that it's scheduled for an exterior sprucing up of its own. Update 2010.01.03: Removed all links to the old Gowanus Lounge domain, which has since been appropriated by some parasitic commercial site. To highlight coverage of last Thursday's Blogfest, I've moved all the links from my original post to this one and organized it by media. I'll continue to keep this up to date as I learn about more. You can also look at my Flickr set of photos from the evening. 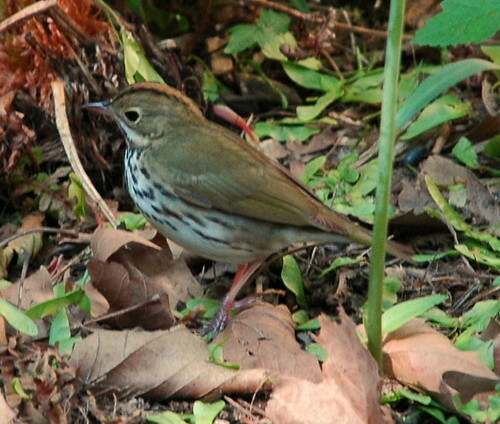 At 4:30 this afternoon, I photographed another "life bird" for me, this time while I was sitting in the backyard garden: an Ovenbird, Seiurus aurocappilus. These are the best from about 35 shots I took in rapid succession. I tried to adjust the color for a truer representation, or at least consistency. I need some better software tools for that, I think. Exposure in the backyard ranges from full shade, to dappled leafy shade, to full sun. And my little visitor ranged through all of it. Most of the shots were ruined due to camera shake, ie: photographer shake. Others were blurred by the motion of the bird itself; in the shade, the shutter speed was too slow to freeze its motion. In the mixed native plant border, that's a cinnamon fern behind, and the stem of a Turk's Cap Lily in front. You can see the orange patch on the crown, a key for this species. Here's the original, full-frame shot showing more of the border. The blurry thing on the right is a wooden planter I'd just finished planting with a female Winterberry, Ilex verticillata. 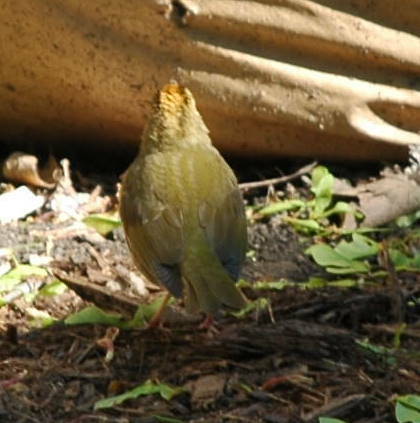 Rear view, also showing the orange patch on the crown. 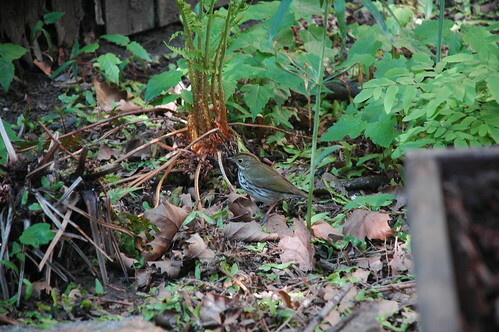 The ovenbird visited me for less than five minutes. It started out in our back neighbor's cherry tree, where I couldn't get a good shot and lost sight of it. I thought it flew off. I was surprised to then see the bird on the ground, beneath one of our Adirondack chairs, about six feet from me. It wandered around the backyard. You can see much of the in-progress gardening clutter around the bird: a bin holding compost, a bag of leaves, and so on. It didn't seem to be probing the ground. Maybe it was just checking out the neighborhood. I take this as a good sign. My plan for the backyard is to recreate a woodland opening. I've been building up a collection of native shrubs, wildflowers and ferns. The past two weekends I've been reorganizing the space, clearing beds, and planting things which have been sitting in containers all this time. I'm starting to recreate the layered foliage structure of a clearing in an Eastern woodland. I feel like the ovenbird showed up as if to say: Getting warmer. Update 2007.06.11: See my photos from the tour. 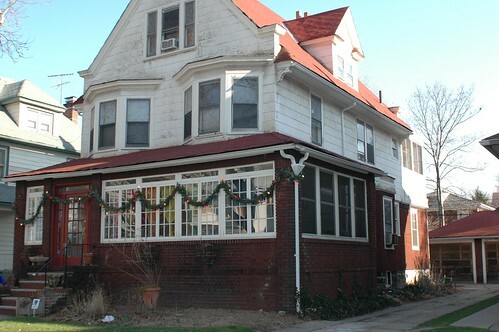 I just learned from Living in Victorian Flatbush, the blog of real estate broker Mary Kay Gallagher and company, that you can now buy tickets for the Flatbush Development Corporation's 2007 Victorian Flatbush House Tour. The house featured in the photograph on FDC's House Tour page is 210 Rugby Road. I hope this means it's on the tour this year. This is in the Prospect Park South Historic District, and it's one of my favorites. At the top of this post is one of my photographs of this house. 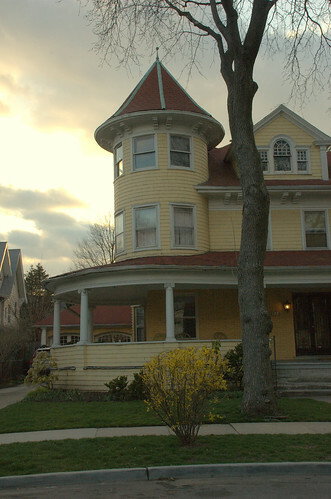 It's a perfect Queen Anne Victorian, with a turret and wrap-around porch. It's also visible from Beverly Road, so I pass it nearly twice every weekday going to and from the subway. One change this year is that the tour starts out at Temple Beth Emeth at the corner of Church Avenue and Marlborough Road. This is on the north edge of the Prospect Park South Historic District. The past two years, the starting point has been the Flatbush-Tompkins Congregational Church in the Ditmas Park Historic District. There are only 12 houses on the tour this year. This is fewer than last year, which was fewer still than the year before. I don't know if this is a trend, or what this signifies for the long-term viability of the tours. The past two years have been House & Garden Tours. This year, apparently, no gardens are on the tour. Surely there are gardeners willing to open their spaces to visitors. Maybe the audiences for garden and house tours are simply too incompatible. Corrected subway directions: As of 5/16, the subway directions on FDC's Web site are still incorrect. I contacted them by email and they're in the process of updating their materials. You can walk 2-1/2 blocks North to Church Avenue from Beverley Road to get there. It's just a longer walk. 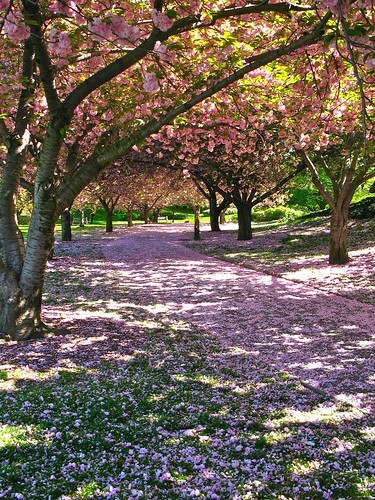 On the other hand, it's also a prettier walk, since you walk through the Prospect Park Historic District. Take your pick! 'Liberty' is highly susceptibility to elm yellows and is not recommended due to variability of resistance to Dutch elm disease. Their top choices for American Elm Cultivars are "Valley Forge" and "New Harmony", both of which they rate "resistant" to Elm Yellows and Elm leaf beetle, in addition to resistance to DED. 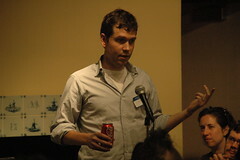 At last night's 2nd Annual Brooklyn Blogfest, one of the highlights for me was getting interviewed by Dope on the Slope. He had some great gardening questions for me, and I hope I did them justice. One thing I got wrong, though, was in response to his question about the American Elm, Ulmus americana. He mentioned that Home Despot is selling American Elms resistant to Dutch Elm Disease (DED). I responded that, although there are hybrids which are resistant, they're not fully American Elms. DED is caused by at least three fungi strains: Ophiostoma (Ceratocystis) ulmi, O. himal-ulmi, and O. novo-ulmi. At least two species of bark beetles - the native elm bark beetle, Hylurgopinus rufipes, and the European elm bark beetle, Scolytus multistriatus - serve as vectors for infection. American Elms, which used to be premier street trees across the country, were devastated by the disease since it reached U.S. shores on imported lumber in 1928. European Elms have been similarly affected. The Liberty Elm, or American Liberty Elm, is the outcome of a decades-long research and breeding program to develop a strain of American Elm, developed only from American Elms, reliably resistant to DED. These are not inter-specific hybrids. They have been developed from survivors collected and propagated from across the country. The resulting plants are propagated vegetatively for distribution. Genetic differences provide diversity. Having six cultivars in the series is insurance against all the elms being wiped out by any disease or problem, even one that might show up in the future. ERI mixes all six cultivars in its shipments. During the research phase for all these new elms, they were challenged with injections of the Dutch Elm Disease (DED) fungus in controlled tests. But the American Liberty elm is now long past the experiment stages, and at this point it has been through the additional test of growing in public locations around the country for over 18 years, where it has been exposed naturally to DED fungus where it may occur in those environments. There is no known American elm variety that can be called entirely immune to DED. The American Liberty elm is resistant to DED, and its resistance has a strong record. In the 18 years since the tree's introduction, ERI has confirmed less than 100 cases of DED among the 250,000 elms it has sent out. Cornell University notes other DED-resistant cultivars available, including 'Princeton', 'Independence', 'Valley Forge', 'New Harmony' and 'Jefferson'. They also note all of these elms are susceptible to Elm Yellows and should not be used where that disease occurs. Any of you gardeners out there have any knowledge about these trees? Do you know of any growing in your area? It was a great event. I was too exhausted, achy, and feverish when I got home to write anything last night. I'll be coming back tonight to write more. A couple of quick notes now. Update 2007.05.11 23:30 EDT: I'm back. Only minor edits and links added to what I wrote earlier today. Some possibly closing thoughts here. I met lots of my fellow Brooklynites and bloggers. I am terrible with names and faces and, well, people, mostly, so if I met you or gave you a card, please leave a comment below to slap me a reminder! A special shout out to my neighbors Brenda of Crazy Stable, and Anne of Sustainable Flatbush, both of whom I met for the first time last night. Despite enduring a root canal from the dentist earlier in the day, my partner tuffed it out and accompanied me to the blogfest. His name tag read "Blog Widow" and he found others last night with whom to commiserate. He said "You're famous" based on the response I received at the open mic. And here I'd thought it was my natural charisma, wit and charm. Or, if not, that the response I received was for "Flatbush" more than me. Represent. News12 Reporter Heather Abraham recording her voice-overs outside the Old Stone House before the doors opened. 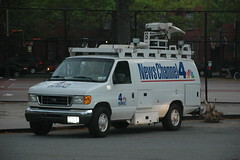 NewsChannel4 Van outside the dog run in J.J. Byrne Park. 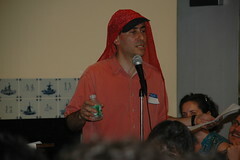 Update 16:36 EDT: BIT airs at 8:30pm this evening on BCAT (Brooklyn Community Access Television). I hope to try and catch it to see if I made any face time. 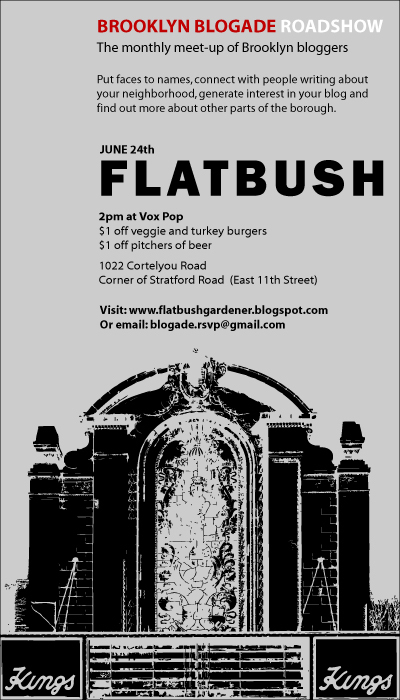 Update 19:45 EDT: And here is the man behind the blog, yours truly, Flatbush Gardener. 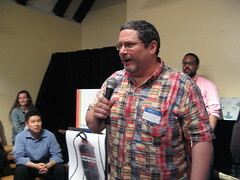 Thanks to the blogfest participants who dared risk their lenses against my visage. All the links now have their own post. 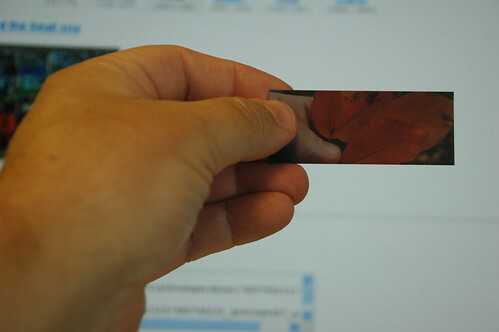 My left hand holding a Moo Minicard with a photo of my left hand holding a cluster of fallen leaves on Rugby Road. I'll be handing these little beauties out at tonight's Brooklyn Blogfest. Each is printed with a crop of one of my Flickr photos on the obverse. The reverse has my name, blog and Flickr site addresses, and the date, time and title of the photo. Disclosure: When I first tried to order these through the Moo site, there was a problem with the order. They apologized, attributing the problem to something to do with Flickr's API. They gave me a coupon code for a free set of cards. Normally, they cost $25 (USD) including shipping/postage for 100 cards, or 25 cents per card. Flickr has a link to Moo on their home page. 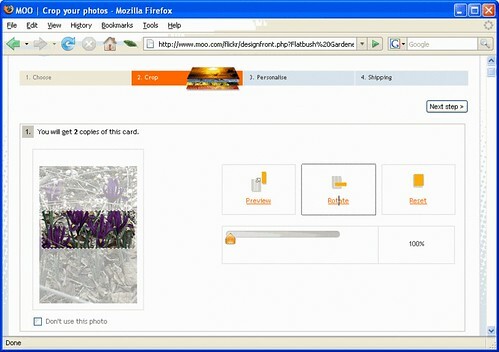 This takes you right to the following steps to create the minicards. For the past few months, I've been collecting sets of my photos by color. The Moo photo chooser lets you filter your Flickr photostream by set. This made it easy to select the best images for each color, and drag and drop them into the selection area. There are 100 minicards in each set. The photos you select are are duplicated as needed to fill out 100 cards. I chose 50 images, so I got exactly 2 cards for each photo. Here you select the crop for each image. You can set the crop vertically or horizontally, and drag it up and down or left-to-right to frame it best for the card. In retrospect, the horizontal images work out best on the card. It's more natural to hold the card horizontally, as I do in the photo at the top of the page, than vertically. This might influence my choices for images if I were to do this again. I figured I'd be able to personalize the cards with my name and contact info. What I didn't expect was that I could include information about each photo on the reverse of each card. I chose to include the date and time the photo was taken, as well as the Flickr title of each photo. Again, in retrospect, I should have made sure that each photo had a text title, instead of the default filename from the camera. The other thing I would change would be to drop the profile photo. It's too small to be of much use, and it take sup too much room which could be used for longer lines of text. I also forgot to include my email address in my info! That's something I would correct the next time I do this. This shows 40 of the different images I selected. I selected 50 images altogether, 2 cards for each image. You can really see the rainbow effect here, as I intended. Everyone to whom I've given a card has remarked on the quality and feel of the card-stock. They just feel good in the hand. They're the same thickness as a business card, but they feel stiffer, both because they are smaller than business cards - about 40% of the area - and because the cards have a matte, plasticy-feeling finish to them. I also spent some time playing around with the cards, arranging them in different combinations, to see how a rainbow photo banner might work. It could be very effective. I'll need to select horizontal crops of my images which could work, and also work out what dimensions the banner should be. I'll also need to play around with different fading or transparency, so that the blog title and other info will be readable against the background photos. Don't send me any chain letters. Because that's what they are, no matter the cause, the reason, or the sentiment. For the reasons why, and information about how you can protect yourself, I defer to this excellent summary from the U.S. Computer Emergency Response Team (US-CERT), Cyber Security Tip ST04-009: Identifying Hoaxes and Urban Legends. What are some types of chain letters? Hoaxes - Hoaxes attempt to trick or defraud users. A hoax could be malicious, instructing users to delete a file necessary to the operating system by claiming it is a virus. It could also be a scam that convinces users to send money or personal information. Phishing attacks could fall into this category (see Avoiding Social Engineering and Phishing Attacks for more information). Urban legends - Urban legends are designed to be redistributed and usually warn users of a threat or claim to be notifying them of important or urgent information. Another common form are the emails that promise users monetary rewards for forwarding the message or suggest that they are signing something that will be submitted to a particular group. Urban legends usually have no negative effect aside from wasted bandwidth and time. How can you tell if the email is a hoax or urban legend? 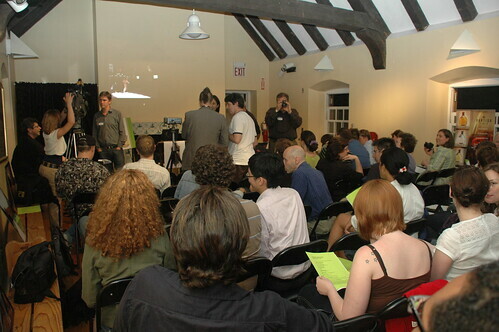 The 2nd Annual Brooklyn Blogfest kicks off tomorrow evening at 8pm in the Old Stone House in J. J. Byrne Memorial Park on 5th Avenue in Park Slope. I'm excited about it, as this will be my first blogger "meet up." I'm listed as one of the "participating bloggers"; basically, that means I've said I'm going to show up, and will introduce myself at the "new bloggers" open mic. I'll also be able to hand out these cool little mini-cards. The blogfest is what prompted me to start my Colors series. I knew I wanted to have some contact info to hand out at the blogfest. Each of these cards is made from one of my Flickr photographs. Disclosure: Moo, the company who partners with Flickr to make these cards, gave me my set of cards for free after I had trouble with my first order. I'll have more to say about all this in another post. On Saturday morning, while I was uploading the photos of the Common Yellowthroat in the apple tree, a flock of at least a dozen of these flew into the same tree. 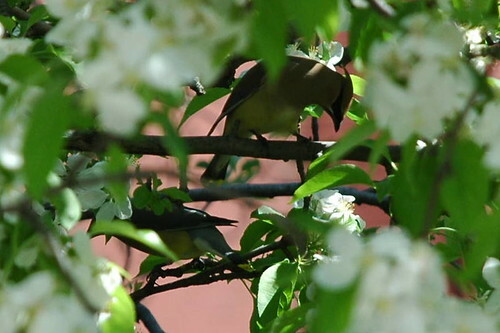 These are Cedar Waxwings, Bombycilla cedrorum. The flock flew in, swarming the tree. Again, I don't know what they were after. I suspect they were after insects in the tree. Who knows how they knew they were there. I noticed the crests, but couldn't make out much else of them. I wasn't able to id these birds until just now, when I took my first look at the photos. I didn't say anything about them earlier because I didn't want to promise something and not deliver! 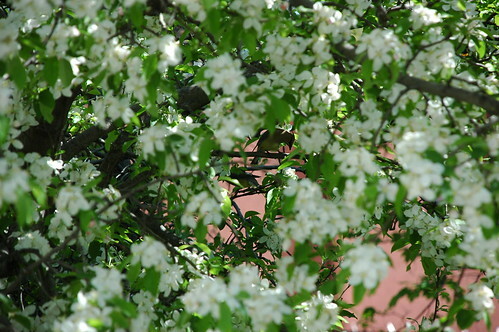 As before, most of the shots were of branches, foliage, and flowers. This was the best of the bunch. I was further frustrated by the fact that, when they nosily arrived, my compact flash card was busy copying the previous photos to my hard drive. I couldn't get the card back into the camera to take more pictures until that was done, which cost me precious minutes. Time to get another card, perhaps. This is a lifetime first for me. As far as I know, I've never seen this species before. And there they were, just 10 feet away from me standing in my tree fort in Brooklyn. When I was looking at the photo above, I showed it to my partner. I asked, "Do you have any idea what this is?" I didn't know. I thought I didn't. Then I said, "I have an idea. Maybe it's a waxwing?" Where does that come from? At what point in my life did I subconsciously absorb the keys for Cedar Waxwing to the degree that when I saw a bird I'd never seen before, that was the first thing that came to mind?! Again, the photo above is a crop of the original, though not as tight a crop as that of the Yellowthroat, so they should be easier to find. Here's the original, full-frame image. Can you spot the waxwings?